Unwanted pests hitching a ride in the mail are a threat to California's billion-dollar agriculture, but they're no match for Dozer the Detector Dog. Read Article. Cody Stark meets "Dozer," a dog trained to protect California agriculture from plant pests and diseases by detecting undeclared plant material and insects in packages. The latest weapon against pests threatening California’s $2 billion agriculture business is Dozer, a canine trained to sniff out fruit insects. 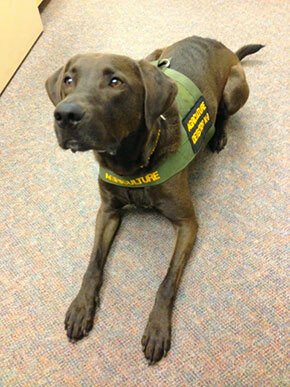 Dozer the detector dog has reported for duty! He brings our total to 13 dogs throughout the state that spend their working hours sniffing around package-delivery facilities, detecting parcels that contain fruits, vegetables, plants and other agricultural materials. These dogs protect California’s citizens and its agriculture from harmful pests, diseases and weeds that could otherwise sneak into our state and cause dangerous and expensive infestations and outbreaks. Dogs can be much more than just man�s best friend. In agriculture, they are also hard-working employees. From farm dogs that help ranchers drive herds to inspection dogs that help prevent agricultural pests from infiltrating the state, these four-legged allies work behind the scenes to get their jobs done. All the dogs used in the program come from rescue groups or animal shelters, and are generally Labrador retriever mixed breeds. The dogs are chosen for their good temperament, energy level, and must undergo basic training at the USDA National Detector Dog Training Center in Georgia before being assigned to a handler. 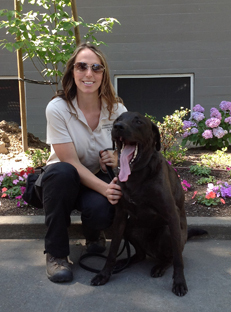 The dog and handler then become a team, which must be certified (and recertified annually) for proficiency by the USDA. On August 1, 2013, Yolo County Inspector Bill Lyon and Sacramento County Dog Team Inspector/Handler Jennifer Berger with dog Dozer intercepted a package from Dania, Florida. The shipper had sent a surprise birthday package to the receiver which included a purse, three mangos, and about 30 small lemons. The purse was released but the fruit was removed from the package. 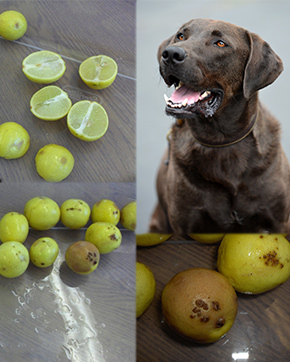 Lemon samples were submitted to the Plant Pest Diagnostics Laboratory for identification. Citrus canker was identified. The lemon fruit violated Federal Domestic quarantine, section 301.75 (citrus canker) and California State Exterior quarantine, section 3250 (citrus pests). The mango fruit violated California State Exterior quarantine, section 3252 (Caribbean fruit fly). Both fruit were rejected for the above quarantines and California Food and Agricultural Code, section 6421 (lack of markings) and destroyed.